As part of Microsoft's 12 Days of Deals, on Sunday the Microsoft Store will have the unlocked Nokia Lumia 635 for as low as $99. The first fifty buyers inside a brick and mortar Microsoft Store before noon tomorrow, will have the opportunity to purchase the handset for $99. Once the fifty units are sold at that price, or the clock strikes 12:01, the price becomes $129, which is still a $50 haircut. The $129 price is also available all day Sunday at the online Microsoft Store. 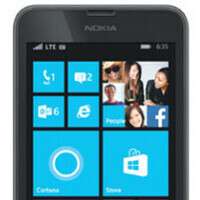 The Nokia Lumia 635 is equipped with a 4.5-inch screen, offering a resolution of 480 x 854. That works out to a pixel density of 218ppi. Driving Miss Daisy is a quad-core 1.2GHz Snapdragon CPU with the Adreno 305 GPU handling graphics. Inside, the device features 512MB of RAM and 8GB of native storage. Need more memory? The 128GB capacity microSD slot is there exactly for that reason. If you love taking selfies, we have to be the bearer of bad news. The Lumia 635 is bereft of a front-facing camera, although it does come with a 5MP snapper on back. An 1830mAh battery powers the model, which is pre-installed with Windows Phone 8.1. And that means that voice activated, virtual personal assistant Cortana comes with the phone right out of the box. If you get up early tomorrow, you can head over to your nearby Microsoft Store, take advantage of the $99 price for the Nokia Lumia 635, and still make it home in time to catch the 1pm kickoff of your locally televised NFL contest. Quality user experience smartphones have never been more affordable than they are these days. Almost makes me want to try WP. Almost. Don't close yourself off from something you may enjoy. You never will know until you try. The unlocked version of this phone is normally waayyy too overpriced. If you were the real Hugo Barra, I would say good luck with that, seeing as your phones are banned phones are banned from the India at this time. But seeing as your actually some random person pretending to be Hugo Barra I will say this. Enjoy your dream kid, because pretending to be Hugo Barra on a tech site is probably as close as your going to get. Meh... no rush, just go to Amazon. You can get the AT&T Lumia 635 for only $55.50, and the TMobile version for $89.98 off-contract. The author's comment on the 128GB microSD upgrade is stupid. No one is gonna spend $100 to upgrade a $55-$90 disposable phone. Buying a 32-64GB microSD at $17-$35 would be much more appropriate. Music junkies will or entertainment junkies will. And you can get lower transfer rate ones for 50ish range. So $100 dollar 128gb phone that can do everything most phones can except front face call....not bad deal at all.